I love Malaysian cuisine so when Awana invited us down to preview new cocktails and nibbles it didn’t take much convincing. 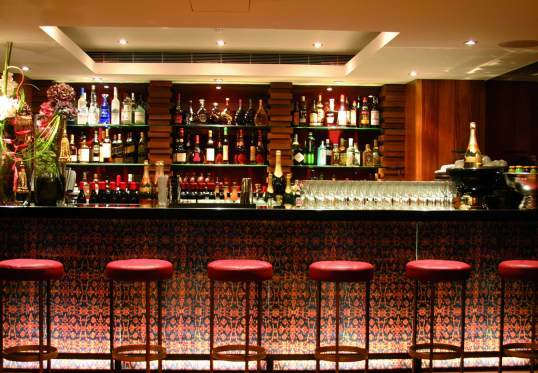 Located in Chelsea midway between South Kensington station and Sloane Square Awana is a classy low key affair with dark wood and neutral tones not dissimilar to other Coca group ventures such as Mango Tree. The cocktail area just inside the entrance is partitioned from the dining room by a glass wall and facing the bar it feels simply like a holding-zone to wait for a table. A long black banquette, cushioned stools and low tables complete the look. The cocktail selection is imaginative and the drinks, ranging between 7-11£, are expertly mixed and beautifully presented. My favourite was the Blooming Hibiscus a combination of Tanqueray gin, lime & lychee juices with a hibiscus flower while the tequila and peach liqueur based Eldeflower Garden packs a surprisingly refreshing punch. This isn’t a top cocktail destination however it is a pleasant retreat in which to enjoy a pre-dinner drink, a post dinner tea or simply a quiet tete-a-tete.